We’ve spent a lot of time of time at LKMco recently reading, talking, thinking and writing about how the education system works for children with Special Educational Needs and Disabilities (SEND) and their parents. You can read “Joining the Dots” a report we’ve written for the Driver Youth Trust about recent policy changes in England (and their implications for children with Dyslexia in particular). We’ve also been writing about the links between SEND and poverty for the Joseph Rowntree Foundation – watch this space! 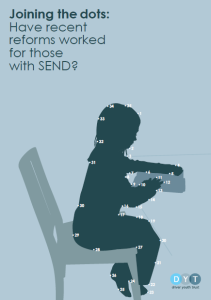 We’ve been encouraged by the positivity of many in the sector, but have been struck that, despite intentions to make it simpler, the SEND system is still difficult to navigate for parents and schools. The challenge now is to make sure all children with SEND access high quality provision, not just those lucky enough to be in schools or areas where excellent provision already exists. Some children with SEND, particularly those from low income families, don’t get the support they need, and this is unacceptable. 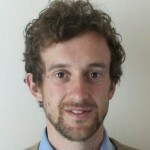 This blog argues that there are many solutions out there already, but that the system as a whole needs to become better at sharing information about what works. 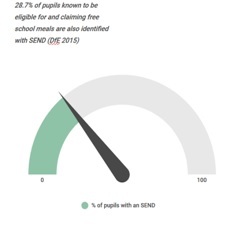 3) There are a huge range of private, voluntary and state providers of SEND services, as well an even greater range of individual needs requiring specific specialised support. The disparate nature of the system makes it hard for local authorities to draw the different strands of available support together. Children with SEND from low income families are still at a disadvantage. It is generally harder for parents from lower socio-economic groups to access information or navigate the complex assessments and tribunal systems. We fear that many children, particularly those from low income families, miss out on the support they are entitled to. Our friends at Special Needs Jungle tell us how difficult and adversarial the process is for parents when trying to secure the support their child needs. In some cases, the hereditary link of some special needs (such as dyslexia) means that conversations with parents and the information provided need to be carefully thought out and delivered. The lack of an effective middle tier is leaving children with SEND in some schools badly isolated. 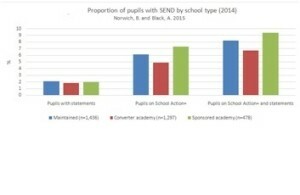 SEND isn’t a priority for all school leaders (although it should be, even from an attainment point of view, given the potential impacts of raising SEND attainment would have on narrowing the gap – see the diagram on the left),and some schools are less confident providers of SEND support than others. This doesn’t have to be the case. We found brilliant examples of SEND provision around the country. Organisations like London Leadership Strategies are trying to help school leaders improve their SEND provision through their SEN Leaders programmes; Academy Chains like ARK are supporting children with literacy difficulties through their Drive for Literacy programme; schools like in the Achievement for All programme are improving the way they involve parents in determining what support a child with SEND receives; and some local authorities like Telford and Wrekin are innovating to integrate services and combine with other authorities. School leaders need to put SEND higher up their priority lists, and all in the sector need to share information about what provision already exists, and how it could be improved. DfE, Ofsted, schools and the middle tier need to act now to share what works across the system. We know how to support children with SEND in education; now we must act to ensure that all those children, particularly those from low income families, are able to access support of the highest quality. Whilst on the topic of sharing information, if you are a young person with SEND, a parent of a child with SEND, or work in the SEND sector, there’s currently an opportunity to share your experiences with OFSTED, open this document and use the links on page 12 to share your views.